Nintendo’s shiny new Switch fighter had its first major outing this weekend at 2GGC’s Arms Saga, where 50 entrants showed up to throw hands (or controllers, depending on your preferred playstyle). The top eight play was tense and diverse, with many different approaches and fighters. Two Byte & Barq players made the playoffs, and Spring Man player Jon “Sol” Lackey took home the trophy. More than anything, this weekend was a showcase for some of the early techniques these high-level competitors are developing. Here’s some of our favorites. 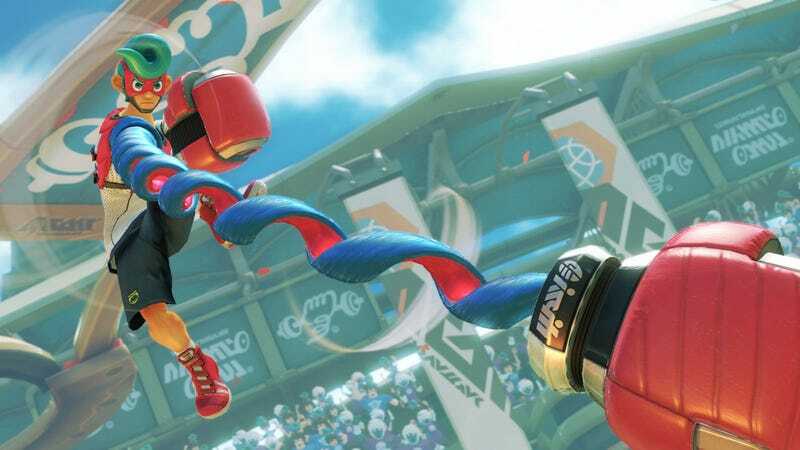 Popularized during Nintendo’s E3 Arms tournament and named after one of the game’s producers who executed it, the Yabuki Combo showed up again when Twintelle player DKL dropped it on Abadango. This specific technique is most often used on Spring Stadium thanks to its bouncy backboards, where one player grabs the other and tosses them into the springboards, then pops their rush meter to juggle them in the air for massive damage. Players were using their rush meter to do all kinds of crazy moves and finishers, but a few used it as a defensive tool. In this clip, DKL pops up once again, this time using his rush to quickly pull his arms back in and guard against a punishing onslaught from NCJacobT. Kid Cobra players used the fighters’ hopping dash to play some fast, furious Arms matches. Rice’s Cobra was especially impressive, using a pair of light, mobile arms to almost dance circles around his opponent. The light taps and short hops in this clip was death by a thousand cuts for his opponent, and some really impressive footwork. We all know that Ninjara is the absolute worst, but here’s a player using his teleport-dash to dodge a significant amount of damage from a rushdown attack. He didn’t dodge every hit, but went Naruto enough to turn a massive swing his direction, and make every spectator rage internally along the way. The final match between Jon “Sol” Lackey and NCJacobT came down to the wire, with Jacob just one round from resetting the bracket and forcing another best-of-five. He had a great showing throughout the tournament on robo-police duo Byte & Barq, but Lackey’s Spring Man was consistent and accurate. In one tiny moment, Lackey pops rush right as Jacob dashes, opening up the single punch needed to end the round. The Arms tournament is over, but if you’re looking for more Nintendo-made fighting action, the Smash 4 bracket will be running throughout today on 2GGC’s Twitch channel.